Exhaust, attic, and whole house fans can have a big impact on your home’s comfort. They can increase airflow, lower temperatures, control humidity, and even eliminate odors. If you need help with a broken fan, or if you want to explore installing a brand new fan, Irish Heating & Air is prepared to help. Our techs are fully licensed and bonded. Need to see our credentials? Just ask! We come to your home or business with the parts we need a vast majority of the time. That saves you time and money. We can repair any part of your HVAC system – many companies can’t say that. Preventative maintenance is the key to avoiding costly repairs in the future – we have plenty of plans available. Our work is covered by a one year warranty. Irish Heating & Air is your one stop for anything involving your fans or blowers. We can install, remove or upgrade any existing fan and take pride in our work, ensuring that you get what you want within your budget. 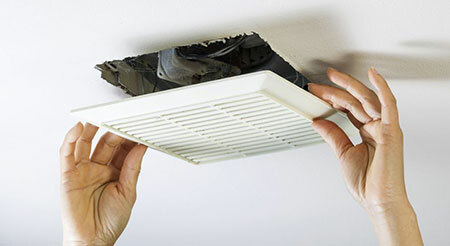 Exhaust fans are critical to ensuring that your HVAC system is working appropriately. They remove moisture and other gases from key areas in your home, like the bathroom and kitchen. Our team can repair and replace a variety of kitchen and bathroom fans, including ceiling mounted fans, wall mounted fans, and fans combined with lighting. If you use your attic for storage or living, you’ll want an attic fan. Running your attic fan during the day will quickly eliminate super-heated air and use air pressure to draw in cooler ambient air. Our team can install a standard attic fan or a solar attic fan that requires no additional power. Installing a whole house fan is a quick way to lower the temperature in your home while simultaneously lowering your AC bill. A whole house fan mounted in your ceiling, but below your attic, draws hot air from your home and forces it into your attic. When the temperature is lower outside, the air pressure difference will draw that cooler air into your home for a fraction of the price of running your air conditioning.